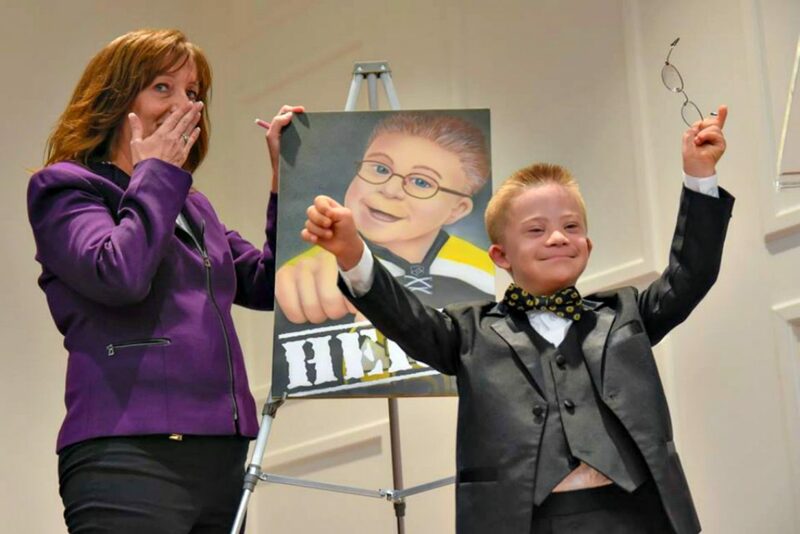 Mary Ellen Wessell, Children's Smile Coalition executive director, with Liam Fitzgerald, better known as the "fist bump kid," at the 2016 Young Heroes Night. 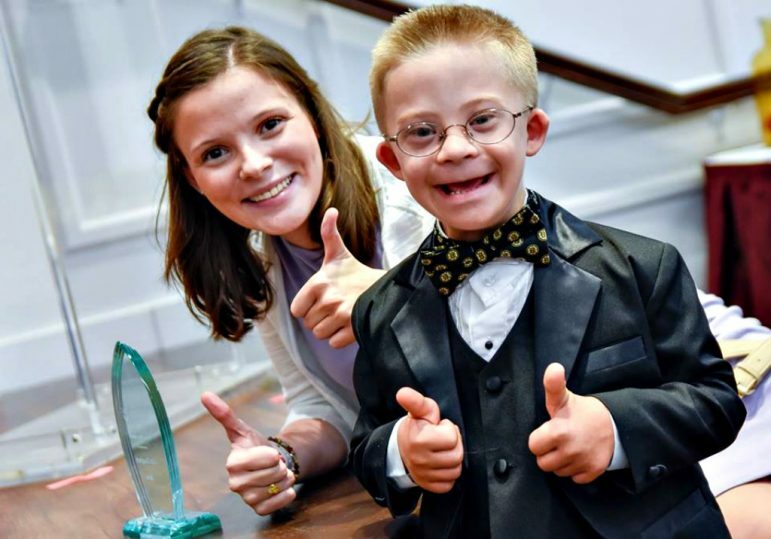 Over the last few years, the Children’s Smile Coalition has been helping children in Worcester County and beyond at a breakneck pace, expanding their work, and winning community awards all while remaining entirely nonprofit. And there’s more to come. Which should come as no surprise to anyone who’s met Mary Ellen Wessell, the group’s executive director. “The most important thing about this charity is that nobody gets paid,” Wessell, a 15-year resident of the Rochdale section of Leicester, said in a recent interview. Wessell and her staff receive no compensation for the volunteer work they do. “One-hundred percent of all donations go to the programs. The executive director and all volunteers receive no compensation,” the CSC website states on the front page. Wessell manages three initiatives that make up the coalition’s core: Santa’s Big League, Project KIN and Young Heroes Night. That’s in addition to an already jam-packed schedule. She is raising a 13-year-old daughter, Shelby, who will follow her footsteps to St. Peter-Marian next year, runs her own consulting firm, Baystate Business Solutions, has a part-time job at Tufts University, and is working to grow CSC. Can Elm Park Community School do its level best? Wishing to avoid all unnecessary costs, and to keep money flowing directly to helping children, she packs her myriad priorities into her home office. Wessell has found the key to thriving in her hectic schedule. “It’s all balancing,” she said. An occasional assist from technology never hurts either. 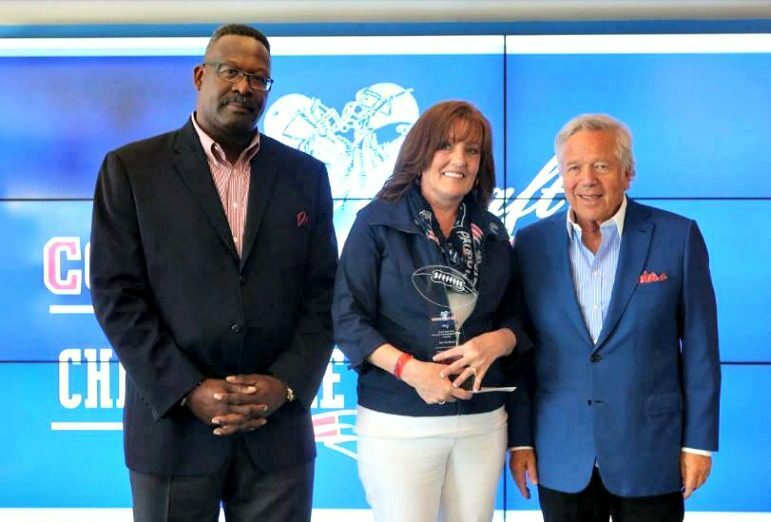 Mary Ellen Wessell, with Patriots legend/executive Andre Tippett and owner Robert Kraft, received a 2016 Myra Kraft Community MVP Award. Wessell saw opportunity in that question, and teamed up with a few trusted board members — Julie Pingitore, her eldest daughter; Nancy Barrett, a childhood friend; and Vanessa Costa, co-founder of Advantage Benefits Group — to create Santa’s Big League. Its purpose was to give gifts and cheer to the teenage children that fell through the cracks of other organizations’ age limits. Santa’s Big League sponsored 125 teenagers across the county in 2016, which translated to Wessell keeping 125 large gift bags in her garage. “Last year one 13-year-old boy got a new mountain bike,” Wessell said. “Kids pretty much got what was on their list – no two bags were the same. The sponsors are very generous to these kids,” she said. All the children who Santa’s Big League sponsored come from the Boys & Girls Club of Worcester. More than 80 percent of the kids from the Boys & Girls club are in poverty. The second initiative of the CSC, Project KIN, is a proactive and thoughtful approach to tackling child poverty. Wessell believes that the best way to reach kids in poverty is through the school system. Because of this belief, Project KIN (short for Kids in Need) brings bins to four schools — Goddard School of Science and Technology, Jacob Hiatt Magnet School, Forest Grove Middle School and Marlborough High School — filled with shoes, socks, toiletries and seasonal clothes including winter coats. Wessell, who estimates more than 500 children have benefited from Project KIN, communicates with the faculty, nurses and guidance counselors of the schools, in order to fill the bins with what’s most needed. This way, kids in poverty can discreetly get the supplies they need straight from the schools. Additionally on Fridays, Wessell delivers snack packs to each of the Project KIN bins, so kids can have nutritious things to eat over the weekend. “In Worcester, [public school students] don’t have to apply [for subsidized meals] anymore. Every student in Worcester gets subsidized meals.” Wessell said. Over the course of the weekend, however, students don’t have that option. The snack packs are a way to fill the stomachs of impoverished students. Wessell hopes to get additional volunteers next year to pack snack kits and work on the logistics of Project KIN. Additionally, a central location to distribute food to the bins would help the project even more, and Wessell hopes to find a base of operations for Project KIN soon. Young Heroes Night takes place at the Hanover Theatre for the Performing Arts and will be celebrating its fifth anniversary this year on Sept. 30. Wessell — winner of a 2016 Myra Kraft Community MVP Award from the New England Patriots Charitable Foundation, and $5,000 grant for CSC — thought the good guys ought to start getting more attention than the bad guys. “Everyone knows what the Boston Marathon bombers look like, and what they did,” she said. The kids nominated as Young Heroes receive an award, the key to the city of Worcester, written recognition from U.S. Rep. James P. McGovern and Gov. Charlie Baker, and a special gift. Last year, the Young Heroes Night honored 26 children, including an entire troop of Girl Scouts. “I had one girl last year, she at the age of nine started a 501(c) nonprofit.” Wessell said. After the girl, Anna Murphy of Stafford Springs, Connecticut, went through a period of financial strain when she had to wear a coat to bed, she created Warming Families Makes Cents to help families in need pay their heating bills. Heading into her sophomore year in high school, Anna has managed in the past five years to expand Warming Families Makes Cents into the neighboring town of Willington. The idea for the charity started in fourth grade, when classmates at Stafford School collected change in jars at area businesses to help pay the heating bills of families who couldn’t afford to heat their homes. Heading into the sixth year, Warming Families Makes Cents is continuing to grow. In addition to collecting funds around late October and Early November, Anna helps WFMC put on an Annual 5k and Half Penny Dash to raise additional funds. In addition to the 5k, the Half Penny Dash is a one-lap run around the Stafford High School track for kids under the age of 11 to run for WFMC. “[Planning and fundraising] takes up a little bit of time, but it’s nothing I can’t handle.” Anna said. “I always stress the fact that you don’t have to come from money to do these things,” Wessell said. She also is not one to sit still. Aiming to do even more for the community, Wessell and a friend, Cheryl Cooney, the director of the Leicester Food Pantry, started renting the former rectory of St. Joseph’s Church in Leicester and plan to turn it into a space that will support a new nonprofit called 24-7 Community Partners Incorporated. In the “beautiful, Victorian” rectory, vendors and shops including an upscale consignment store will start business. According to Wessell, there is space for more than 20 vendors on the first floor of the rectory alone. All of the proceeds from 24-7 Community Partners Inc. will be split between the Leicester Food Pantry, the Rochdale Food Pantry, and the Children’s Smile Coalition. 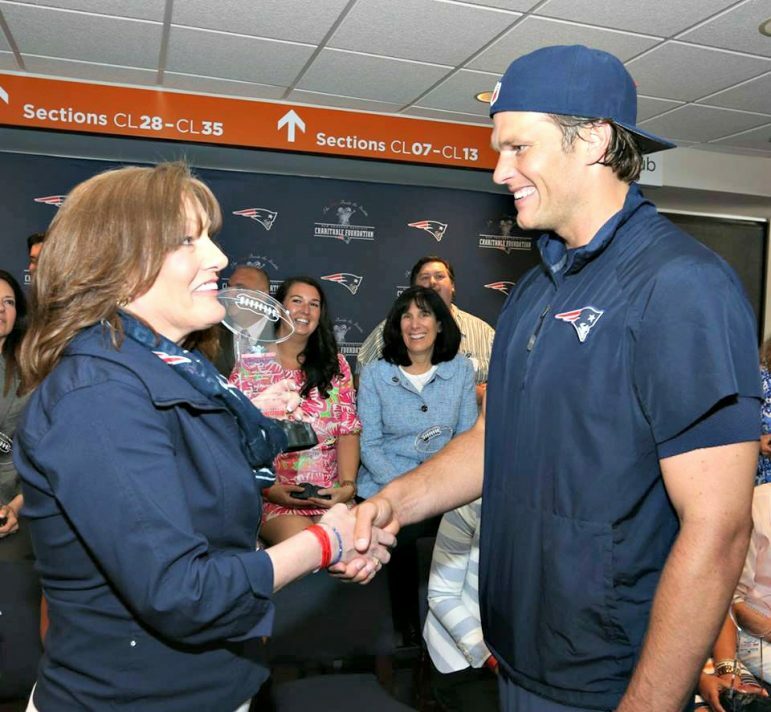 Mary Ellen Wessell meets Tom Brady at the 2016 Myra Kraft awards celebration. One more thing that will be able to come from this expansion is a discretionary fund for 24-7. This discretionary fund will allow 24-7 to send immediate relief to emergency cases, such as victims of house fires and sudden medical emergencies. Additionally, there is a huge parking lot in the back of the rectory where Wessell hopes to hold community yard sales and farmers markets. “I’ve always said that I hope 50, 60, 100 years [from now] that the CSC will be around [and] my children and my grandchildren will be running Children’s Smile Coalition. It’s a legacy I want to leave,” Wessell said. That will put a smile on lots of faces — young and old.